Seventh Street Books, 9781616140175, 271pp. A young inventor and his wife are killed in a terrorist attack—leaving behind a will that surprises friends and parents by directing a vast fortune toward charities in the developing world. On the ground in Afghanistan, international charities rapidly search for Afghan partners to compete for the attention of the new foundation, focusing their efforts on two particular women in the village of Laashekoh: a young mother who might have been wrongly imprisoned for her role in helping to run a child-trafficking ring; and an older, educated woman who has a reputation for providing reproductive healthcare—including abortions. Meanwhile, most Laashekoh villagers do not want Western charity and are astounded to be regarded as potential recipients; they are self-sufficient and see no need for outside intervention in village concerns. But when a group of orphanage workers visiting the village goes missing, foul play is immediately suspected and the villagers face tough questions. As Afghans and Westerners work to uncover the truth, the reputations of charity workers, potential beneficiaries, and locals in Laashekoh are called into question. The stakes are high, the sums of money are huge, and cultures clash. All these are motivations for fraud and murder in Allure of Deceit. Susan Froetschel is the author of four previous novels—Fear of Beauty (named top mystery/suspense by the Military Writers Society of America and nominated for a Mary Higgins Clark Award), Alaska Gray, Interruptions, and Royal Escape. She has taught at Yale University and Southern Connecticut State University. She lives in Michigan and is currently an editor with YaleGlobal Online at Yale University's MacMillan Center for International Studies. "Allure of Deceit is a complex stew of hidden ambitions, good intentions and lies that unravel to devastating consequences. This novel captures the reader in much the same way as an intricate puzzle." “Froetschel is a superb storyteller. 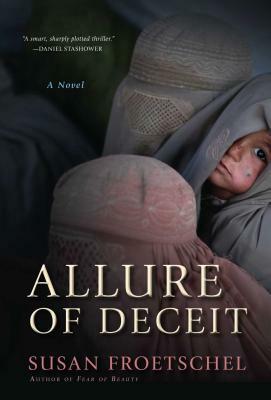 She brings the rugged beauty of Afghanistan, its simple folk, and its many dangers together in a spine-tingling tale."